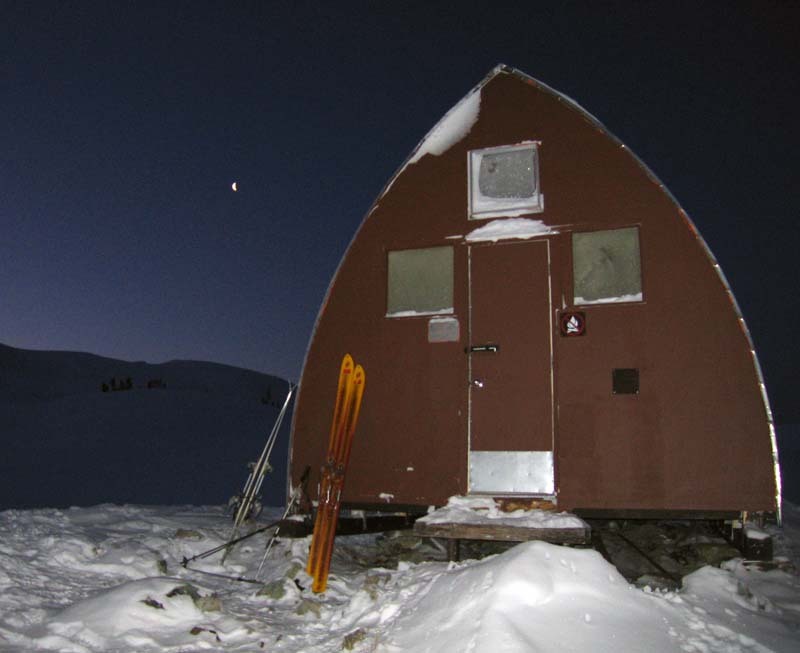 With the forcast bringing us a couple of days of sunny skies and warm temperatures we figured a trip to a hut was a good option! Figuring everywhere in the Duffy would be busy we opted for the Himmelsbach hut since its lack of heat would keep most people away. This trip report has A LOT of photos since I wanted to have a photo document of this area. 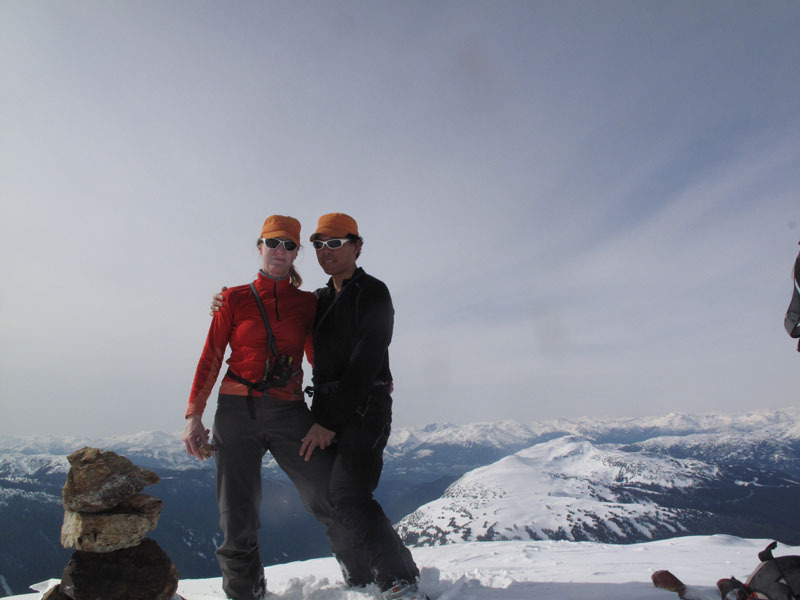 We left Whistler at 10:30 Friday morning and got to the hut at 12:30. After unpacking and eating some lunch we headed off to Fissile to see what the mountain had to offer us. 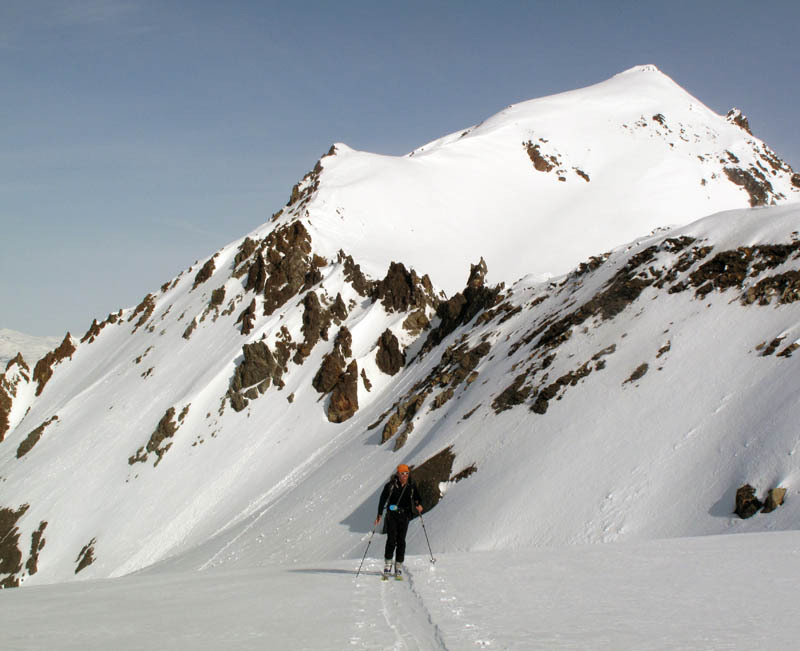 Heading up and over Flute, the most direct routeover to Russet Lake – Himmelsbach Hut – is to stay on the southern edge of the musical bumps. 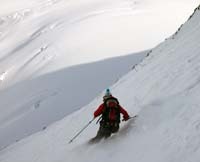 We kept our skins on for all the descents and took the least steep aspect so we could get there as quickly as possible. Red is the route out, Blue is the return. 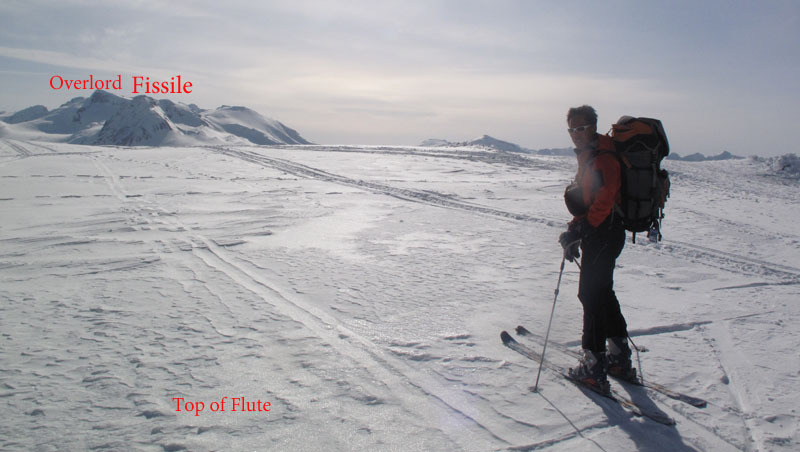 From the top of Flute you can see into the Spearhead range. 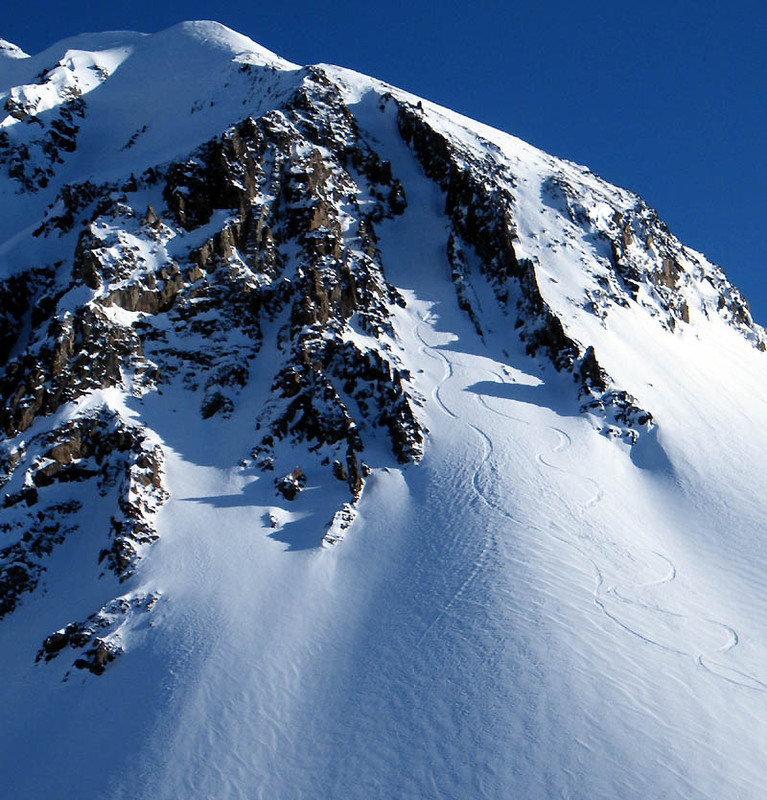 As well the many lines on Cowboy Ridge and Oboe which hadn’t seen many lines yet. 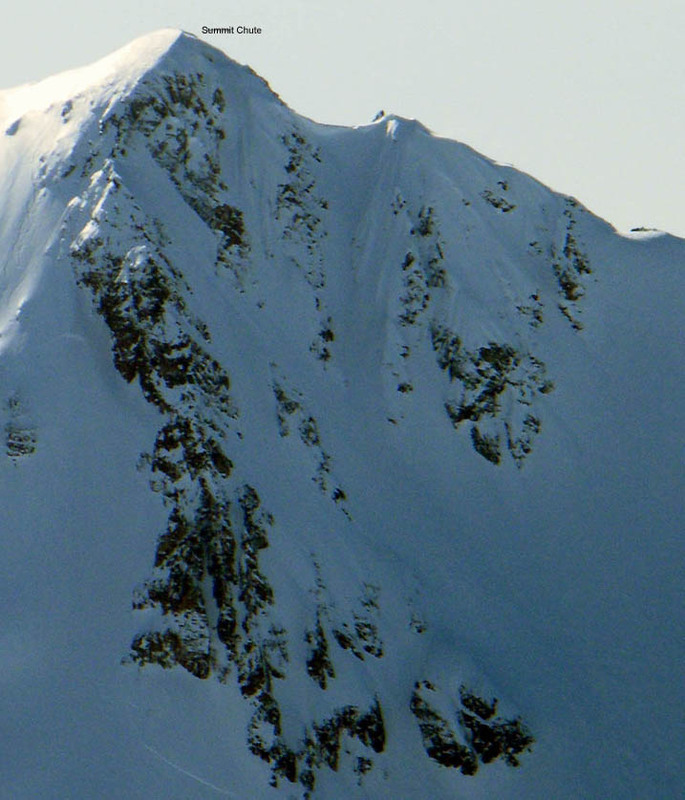 View of Cowboy Ridge from Oboe. 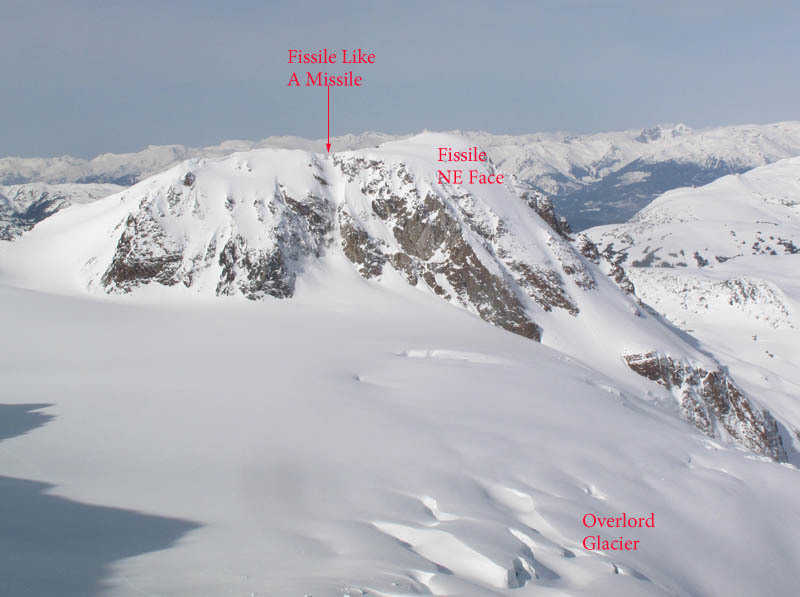 We skin up Whirlwind, after an hour we start the boot pack from Fissile/Whirlwind col to Fissile ridge. Fissile is pronounced Fiss-aisle – It is a geologic term refering to a rock that splits into shards owing to the plate like minerals being oriented like a stack of plates. This picture demonstrates the apt name. On the ridge that Lee has visited many times, this being my first. He is in his happy place. The view looking back towards the resort from the top of Fissile. From here Lee decides to take me down the 55o NE Face. Overlord looms in the background. 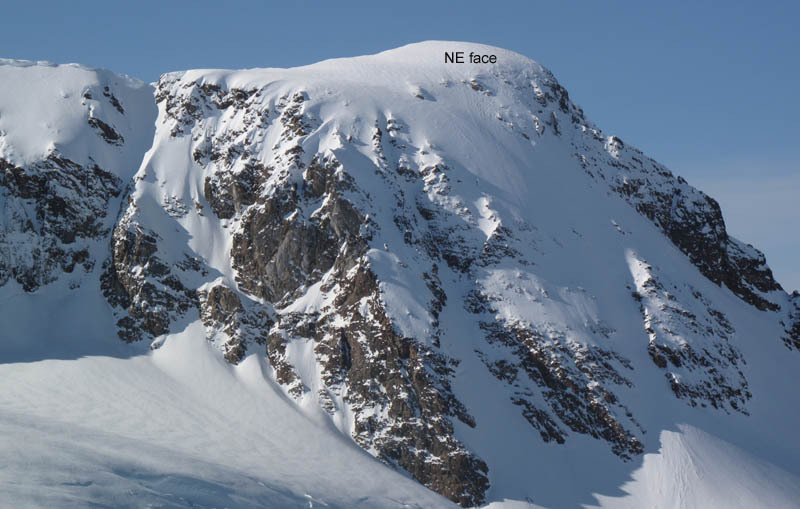 The NE face is pretty steep! We have to continuously tend left to avoid the cliffs below. 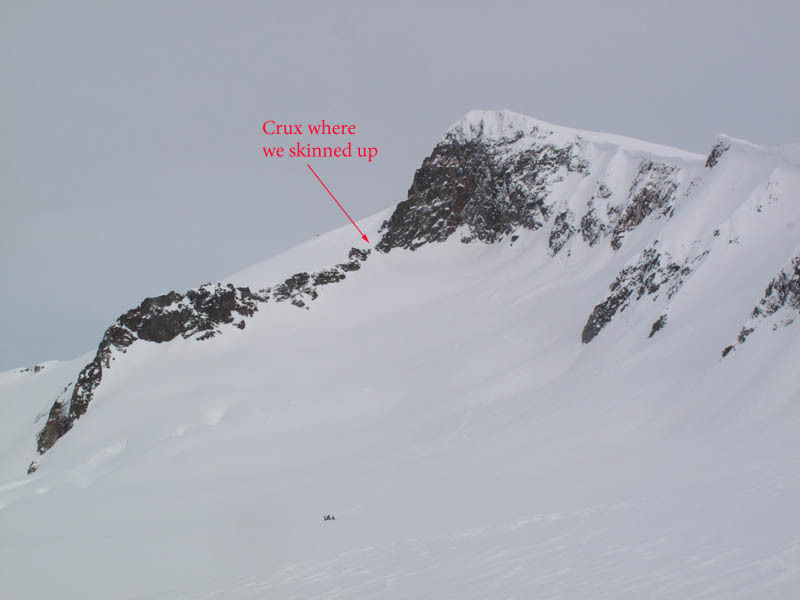 We tend over towards the NW face and come out over some cliffs to avoid avalanche debris on the normal exit. Once past this crux it was all good. The snow was great all the way down. Once down we went to the creek and filled up our water bottles and got back to the hut. 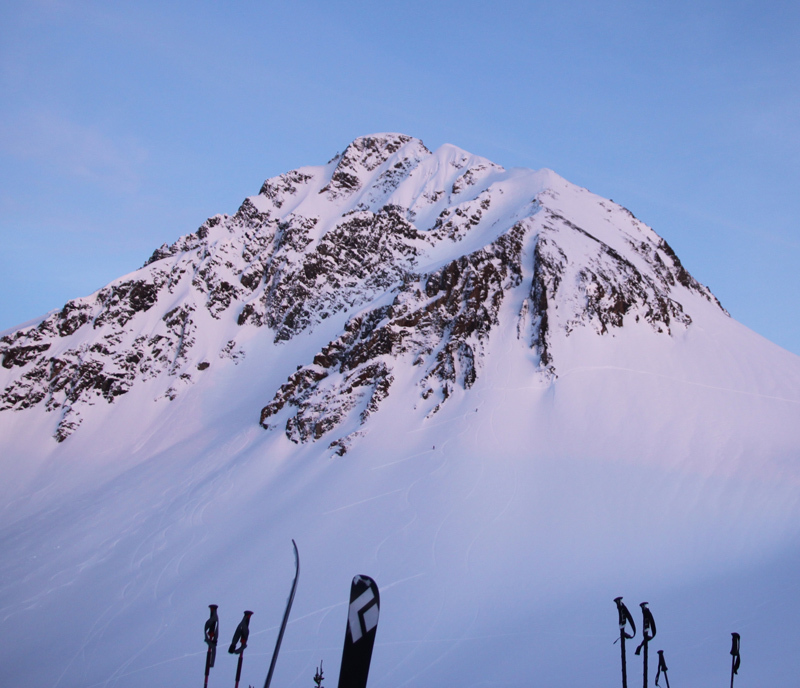 Fissile in the Alpenglow. 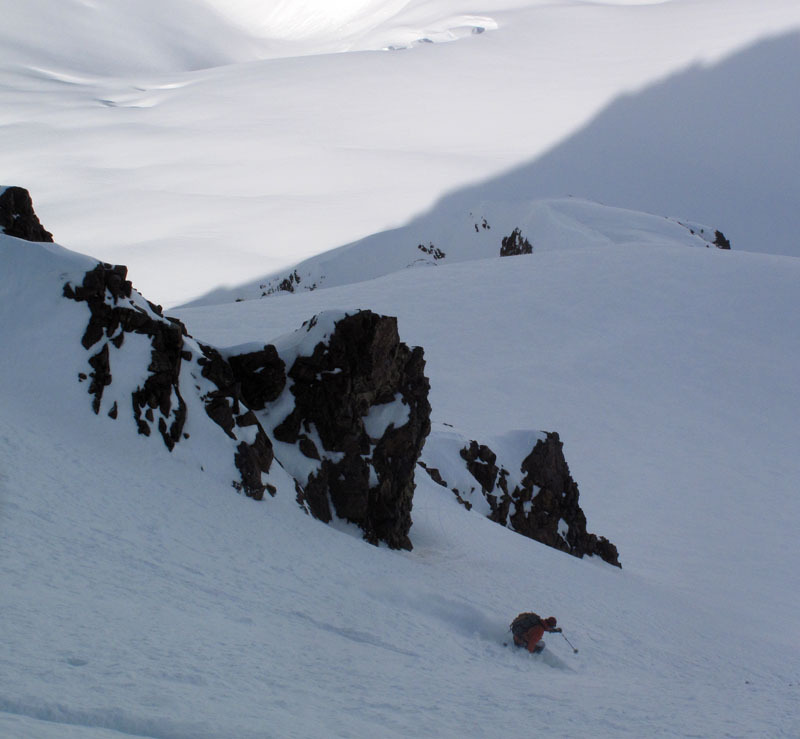 A photo of the NE face from one of Lee’s previous trips. Since Lee is like a puppy dog and has to go go go, he goes for an evening lap to ski Psycho Chute. 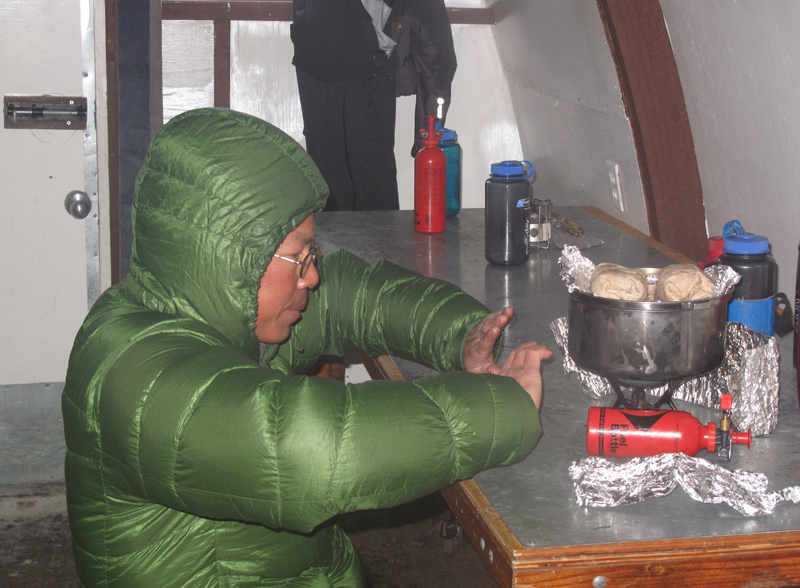 The cabin was pretty warm all night, but even at zero degrees its nice to have the MEC Reflex Down on while cooking breakfast! 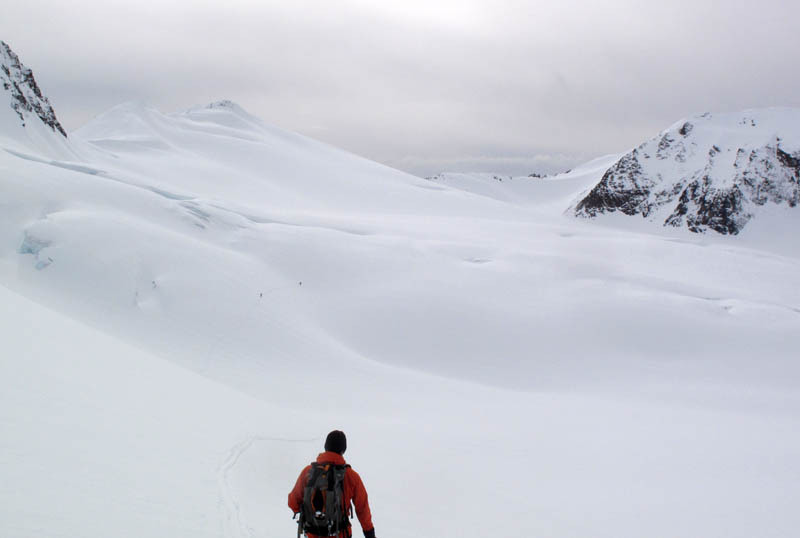 The next day we decide to do a little tour to check out some other aspects of the range that you don’t normally see when you’re doing a traverse. We head back up Whirlwind. 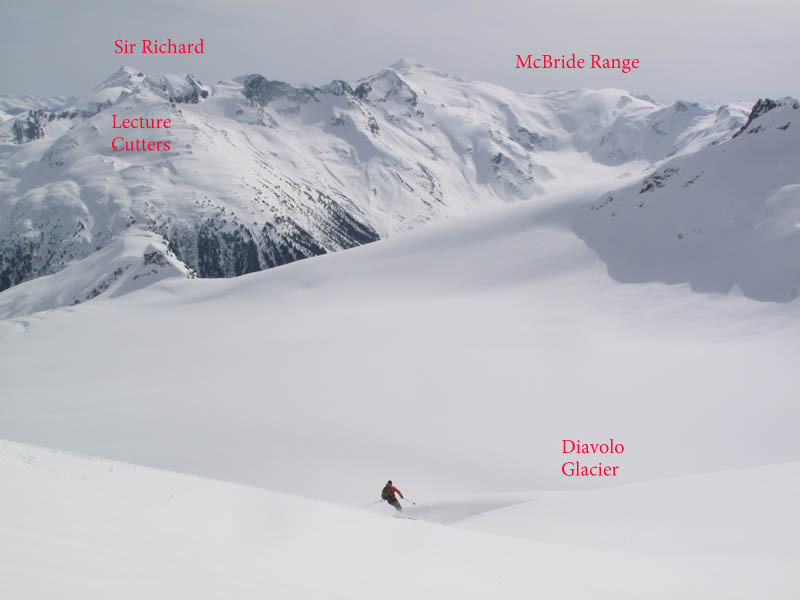 We ski across the top of the Overlord glacier and stay high so we can get quick access to Benvolio and Diavolo. Thought we would have to boot pack this but we managed to skin all the way up! Looking back you can see Fissile, the NE face that we skied yesterday and another line that Lee has skied before and I probably won’t. View of the rest of the Spearhead range from between Overlord and Benvolio. 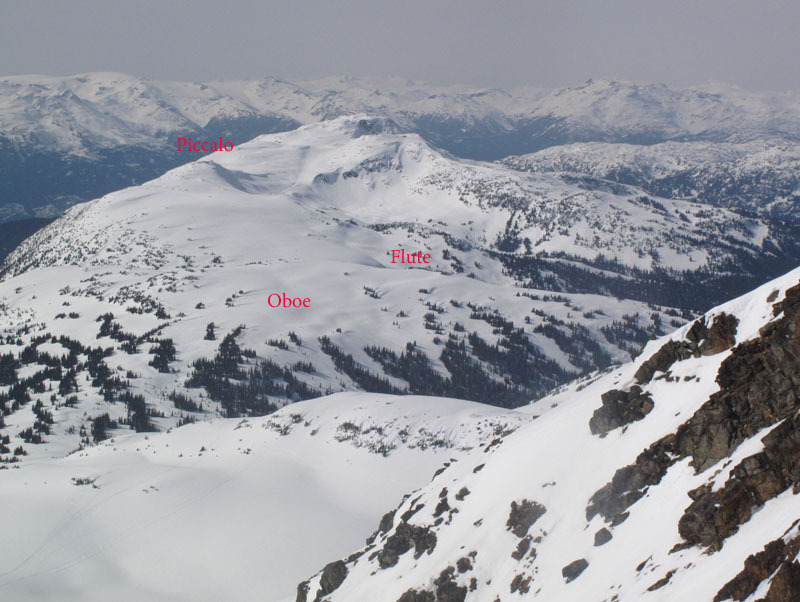 At the Benvolio – Diavolo col you have a good view of the ranges in the back heading towards Pitt Lake area. Huge area here, Diavolo glacier is quite broken. 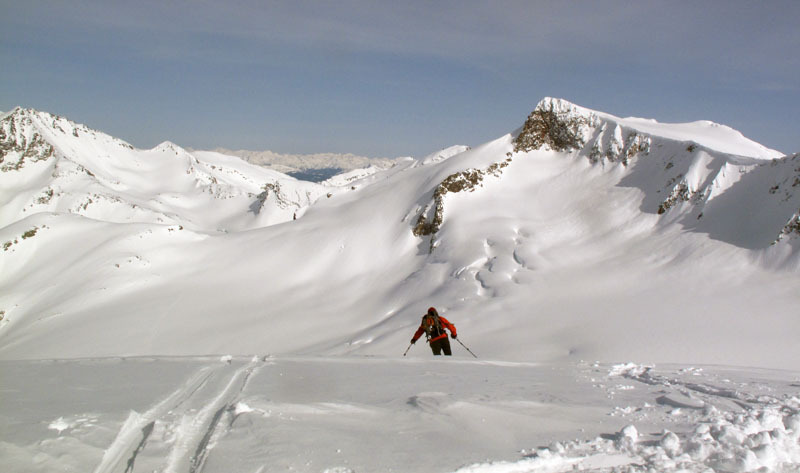 With good snow this could be a great area to play early in the winter before the sun hits it too hard. 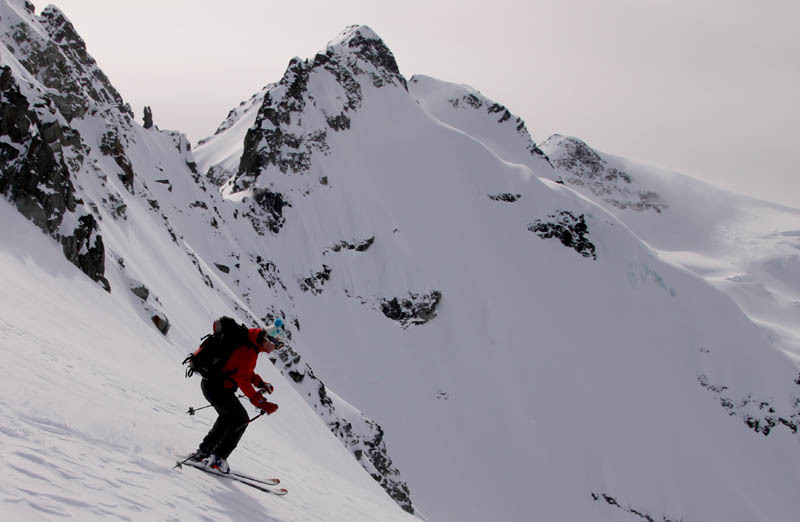 Sharon skiing down Diavolo with Cheakamus in the back. 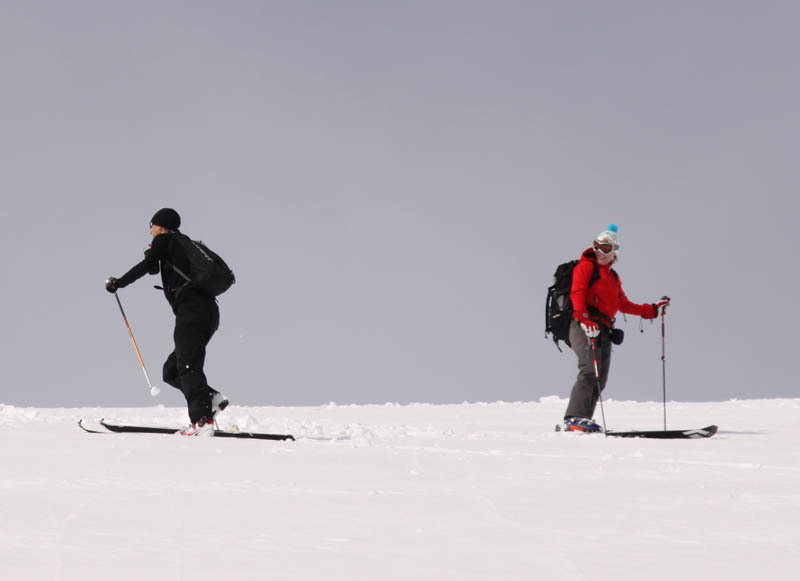 As we were heading down we see this Randonee guy coming up with minimal gear, skinny skis and given’ er. It was Alex Wigley pulling off a spearhead before work! 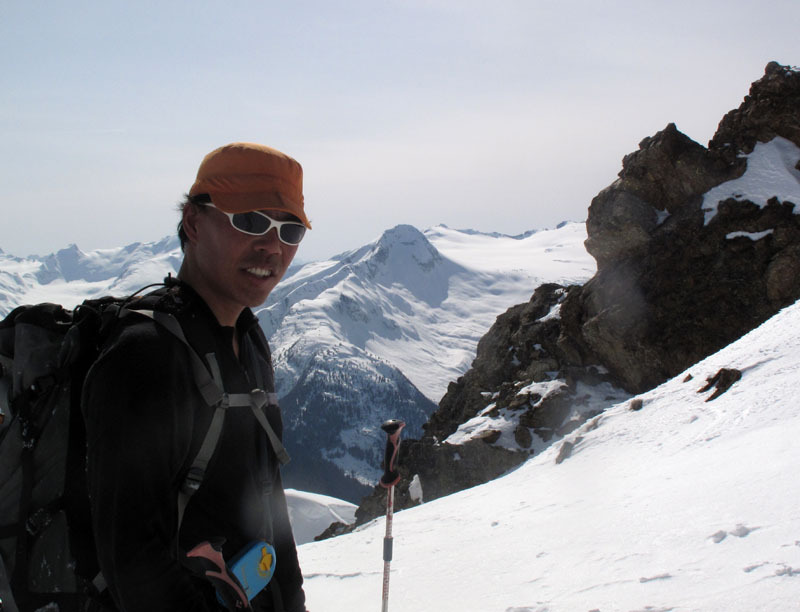 Alex does a lot of randonee racing and skiing in the area. 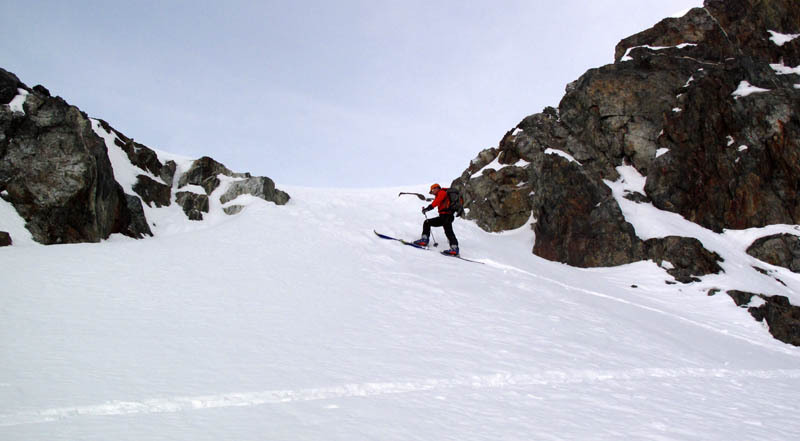 You can read all about it in his Blog – Ski Theory. 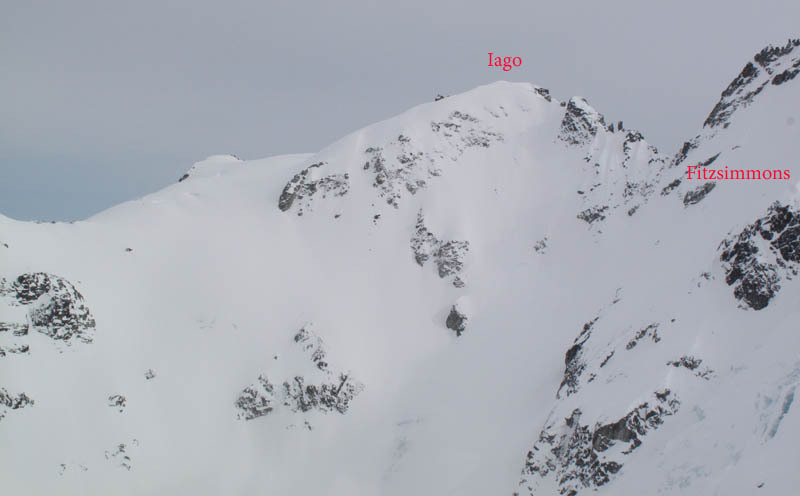 After heading up Diavolo to Iago col we head to Iago to see about skiing down its North West face. 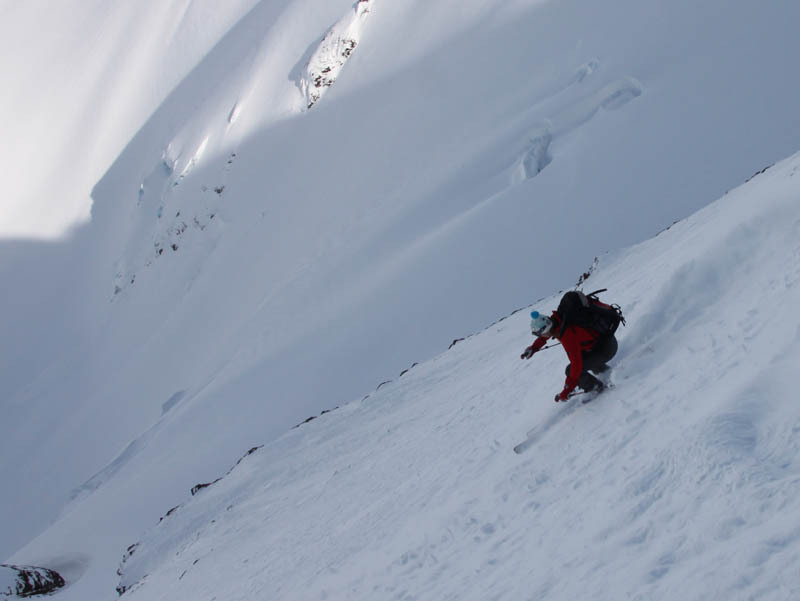 I chicken out and we ski down a more mellow slope. You can see the N face of Fitzsimmons in the back. The snow was started to get more wind effect. 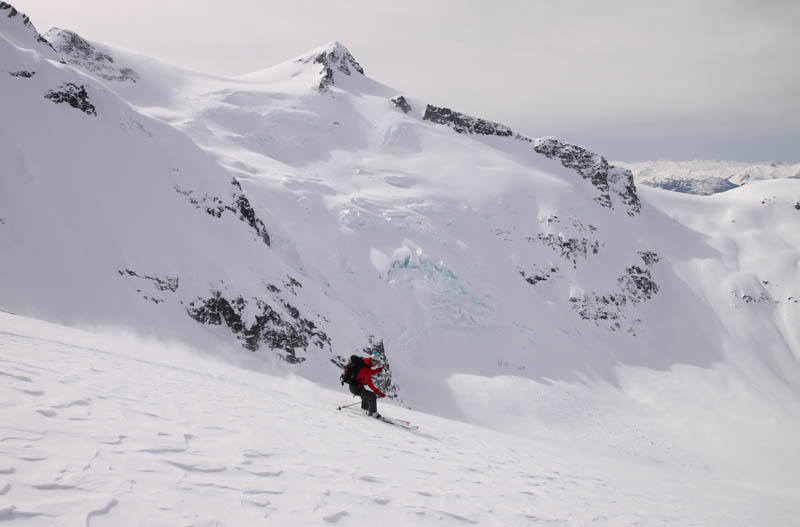 Once down at Fitzsimmons glacier we looked back to see the steep Iago line. Next time. 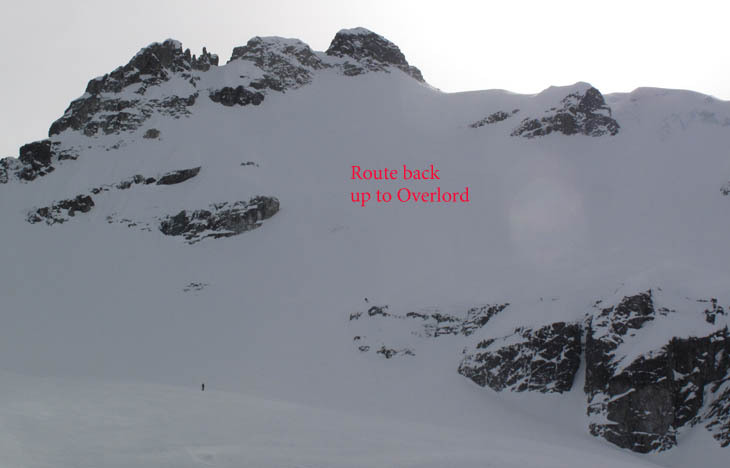 From here we skinned back up to Overlord to get back up for better options back to the hut. 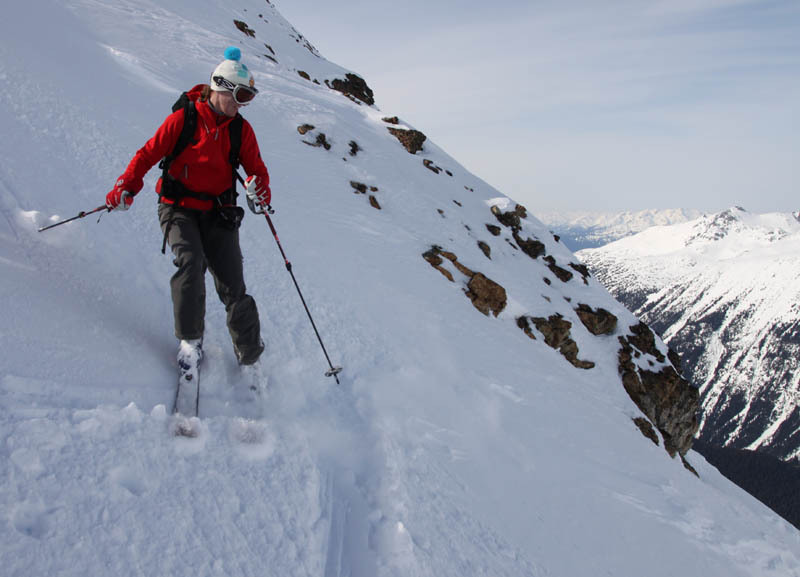 You can also head further down the valley and skin back up right to the Hut. 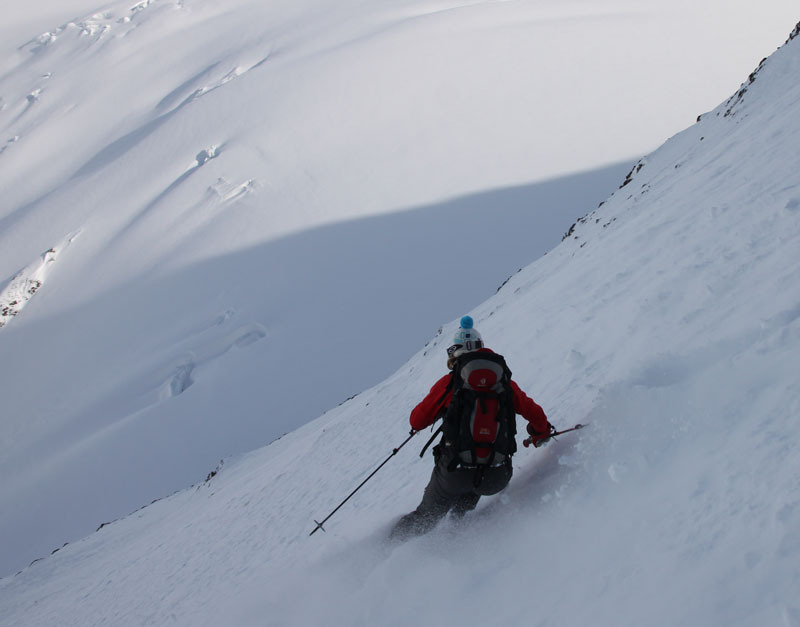 Heading back across Overlord Glacier. Fissile is on the lookers right. 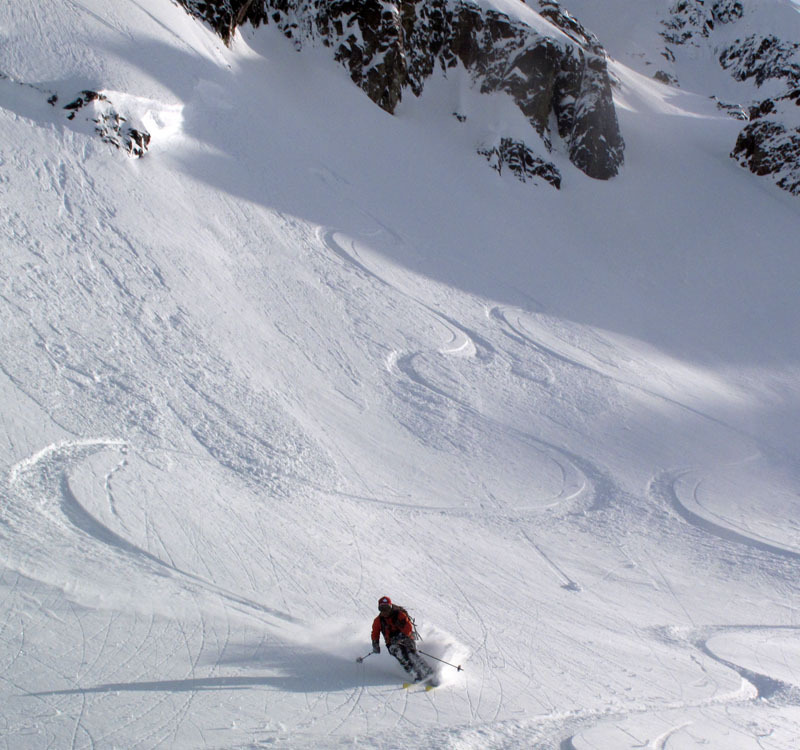 Skiing down Whirlwind. You can see Cheakamus Lake in the valley with no ice! Once we get back to the cabin we are joined by Tyler and Lee who will be staying the night, and Trevor who just came in for the day. 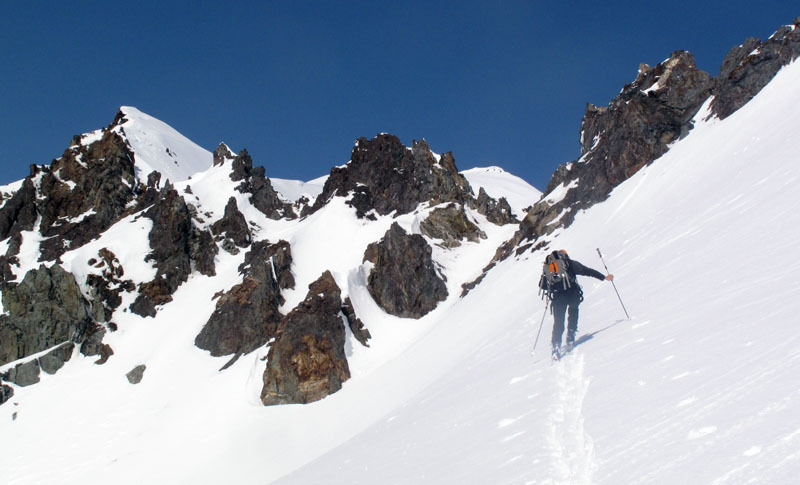 They just got back from skiing Saddle chute. 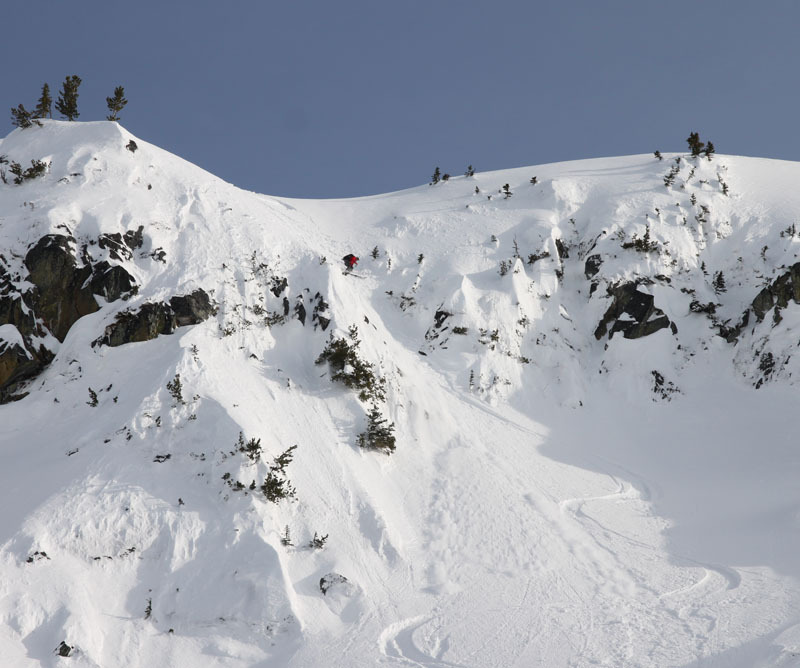 Lee and Tyler, being the keeners they are, decide to go for another run on Summit Chute. Zoom in if you can’t see the tracks. 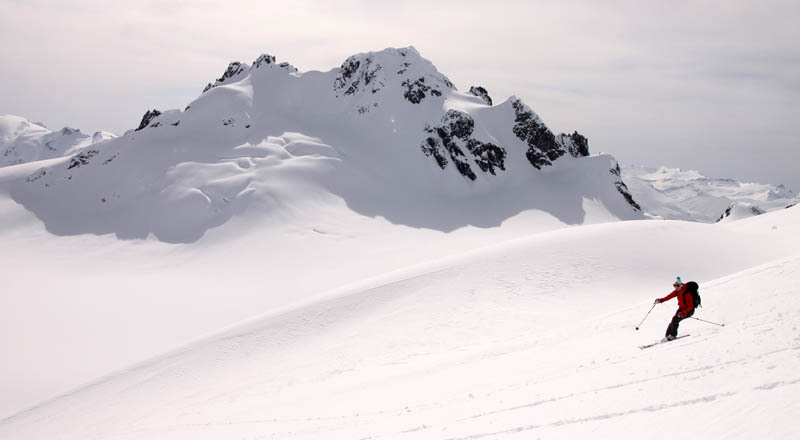 Peak & Iago from Lee Lau on Vimeo. 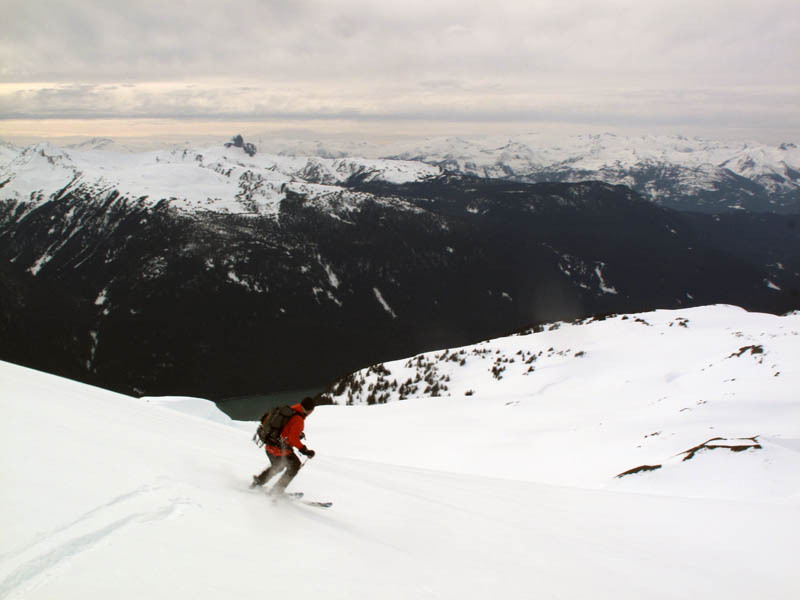 This entry was posted in 2010, ski and tagged Russet Lake, Whistler Backcountry. Bookmark the permalink.